A first good look at the U.S. version of the new subcompact, the 2011 Ford Fiesta. Ford has recently launched its new Fiesta Sedan in China, but we caught the U.S. spec version – and – for the first time – a good look at the unique (North American-spec) grille and front fascia. 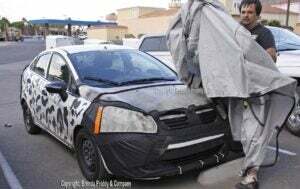 It also appears that the Fiesta sedan will have different front and rear bumpers from those seen on the cars it has shown elsewhere, as well as minor interior changes. The Fiesta will finally put Ford back into the subcompact market, which company officials have said is a critical step in their switch from a heavy emphasis on light trucks to a more fuel-efficient passenger car model mix. Moving into the top tier? I think that when you are in the luxury market, you need more than just product. Johan de Nysschen has always wanted a career in the auto industry, but it wasn’t easy, not when growing up during the final days of the old apartheid regime, in South Africa, when most of the world’s automakers were convinced to grudgingly abandon the market. Eventually, however, de Nysschen found a way into the business, and has since served a variety of global assignments for Audi of America, including a stint in Japan and, now, a position as the CEO of the Volkswagen luxury division’s U.S. subsidiary. While Audi of America wins numerous kudos from the media – and loyal owners – it has struggled to gain ground against better-known competitors Mercedes-Benz, BMW and Lexus, a point of frustration considering Audi’s huge growth abroad, global sales topping the million mark for the first time in 2008. 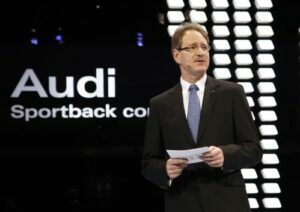 But there are positive signs in the U.S., as well, where Audi’s market share has surged during the economic downturn. TheDetroitBureau’s Paul A. Eisenstein spoke with de Nysschen about the challenges of moving into the top tier of luxury brands – and how he can exploit the weaknesses of its competition. TDB: While the Cash-for-Clunkers program didn’t do much, directly, for luxury brands, it certainly did have an impact on the overall car market. Can you talk about what you’re seeing happen? De Nysschen: We had expected the total vehicle market to come in (for 2009) at 9.5 million, which made us one of the more conservative manufacturers. Cash-for-Clunkers injected some life into the market and overcame some of the inertia, so we’ve raised our outlook to 10 to 10.5 million. As for Audi, we sold about 600 cars through Clunkers, which, does nothing to materially change our business. TDB: Maybe not, but you’ve done surprisingly well, despite the overall decline in the U.S. market. 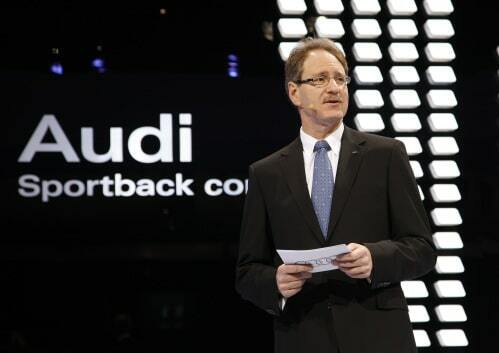 De Nysschen: Audi has been a little more fortunate than most and kept much of its momentum. We’ve had the benefit of a new product line-up, so our incentive spending hasn’t been almost completely flat compared to last year. Our model mix has trended upwards, so our revenues are flat compared to last year. Last year, we did 86,000 cars, so we expect to end this year around 75,000 or 76,000 (but) we’ve had a significant increase in market share – to 8.1% of what we define as the luxury group, from 6.2% last year. Volumes are down just over 14%, but the sector has declined over 30. We hope to extend the momentum when the market comes back. The bad news keeps coming at the world’s largest automaker. Lawsuit is latest image blow. Oh my, what a feeling. It seems that the hills overlooking downtown Los Angeles aren’t the only things burning in Southern California right now. So is Toyota’s image. The fallout had barely settled down around Toyota’s announcement last Friday that it planned to halt production at New United Motors Manufacturing Incorporated in Fremont, California, across the bay from San Francisco when the Japanese automaker was rocked by a lawsuit filed at the other end of California. 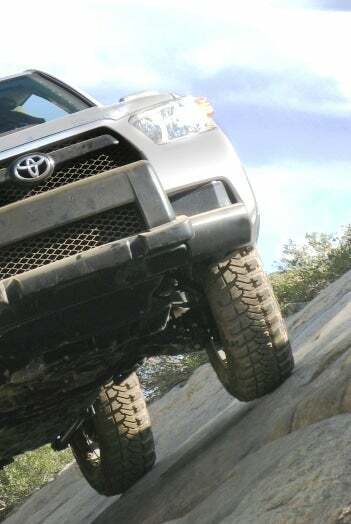 The legal complaint filed in U.S. District Court In Los Angeles claims that Toyota had suppressed evidence in hundreds of lawsuits spawned by rollover type accidents involving the Toyota vehicles. Of course, lawsuits against automakers are common, but this particular story had one spectacular twist — it was filed on behalf of an Southern California attorney, one Dimitrios Biller, who worked for Toyota at headquarters in Torrance, California for four years from 2003 and 2007. Toyota’s lawyers have already gone to court to try to get the suit sealed off from public views by having the court record sealed, claiming the plaintiff has violated attorney-client privilege. Biller and his attorneys, however, have temporarily outflanked Toyota’s defense by carefully leaking the lawsuit to the investigative unit at CBS News, insuring that the initial complaint got plenty of attention in the media around the country. 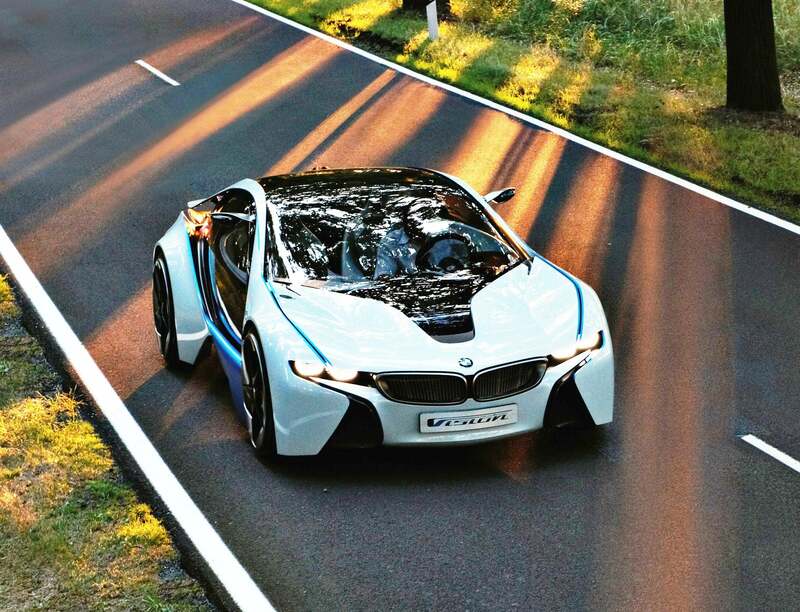 This hybrid concept works around CO2 regulations. There is no question that Vision is an extremely sophisticated engineering exercise. How about a 3-cylinder turbocharged diesel M car from BMW? Well, if you add two electric motors, one on each axle, and lithium ion batteries under a sleek 2+2 body, the additive power effect is 262 kW/356 horsepower, with maximum torque of 800 Newton meters (590 lb-ft.). Is that an M? 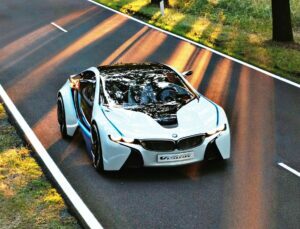 BMW claims the sports car will accelerate from zero to 100 km/h in 4.8 seconds, with an electronically limited top speed 250 km/h. With all that torque, there’s little reason to doubt that Vision is fast. Fuel consumption in the EU test cycle is 3.76 litres/100 km and CO2 emissions are 99 grams/kilometer well under proposed EU standards — the main reason this particular configuration exists. As a plug-in hybrid, Vision is able to cover the entire test cycle under electric power alone. BMW calculates this reduces the CO2 emission rating to just 50 grams per kilometer, which takes the sources of energy used for generating the electric power consumed into account (EU electricity mix). Whether Vision makes it to production or not is moot. We’ll wager one or more BMWs with a powertrain like this will be used to generate credits so that BMW can keep selling more conventionally figured cars that consume many more liters of fuel and emit what would otherwise be illegal levels of CO2. Along with re-makes of 2010 Range Rover and Range Rover Sport, British marque signals a new direction. The Land Rover LR4 replaces and upgrades the old LR3. The new model features a bigger engine, a more refined interior, improved Terrain Control and a quieter ride. 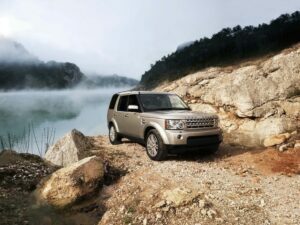 In its first new product introduction since the takeover of Jaguar and Land Rover by the Indian conglomerate Tata, Land Rover has introduced a trio of new luxury SUVs for the 2010 model year, the LR4, which replaces the LR3, a heavily reworked Range Rover Sport, and an all-new Range Rover. Like many recent luxury entries, including the 2010 Mercedes-Benz E-Class, Land Rover is playing the value card for a recession-weary buyer. The new LR4, which will come in the door at a price of $51,750 (including D&D charges), is some 5.6 percent less expensive, comparably equipped, when compared the 2009 LR3. Aside from the obviously cleaner and more modern appearance, including new fenders without plastic flares, hood, grille, lamps and air intakes, the LR4 has substantial chassis upgrades for better, less-nervous highway ride. A new TRW variable-rack power steering system takes care of that, along with new suspension arms and knuckles that move the center of gravity closer to the roll center, which means far less body roll in fast corners. The all-wheel-drive system carries a new center differential that biases more power to the rear tires on full-throttle acceleration. Power brake failures are possible in cold weather states. All the recalled cars have 1.8-liter engines. Toyota Motor Sales, U.S.A., Inc., will launch a voluntary Safety Recall next month with the National Highway Traffic Safety Administration (NHTSA) involving approximately 95,700 Toyota and Scion vehicles sold in the United States; about 10,000 2009 Pontiac Vibe models are affected as well. Some of the vehicles were built at New United Motors Incorporated, the plant in California that Toyota will close next March. Pontiac Vibe models ceased production there earlier this month. Other models were built at Toyota City in Japan and Cambridge, Canada. 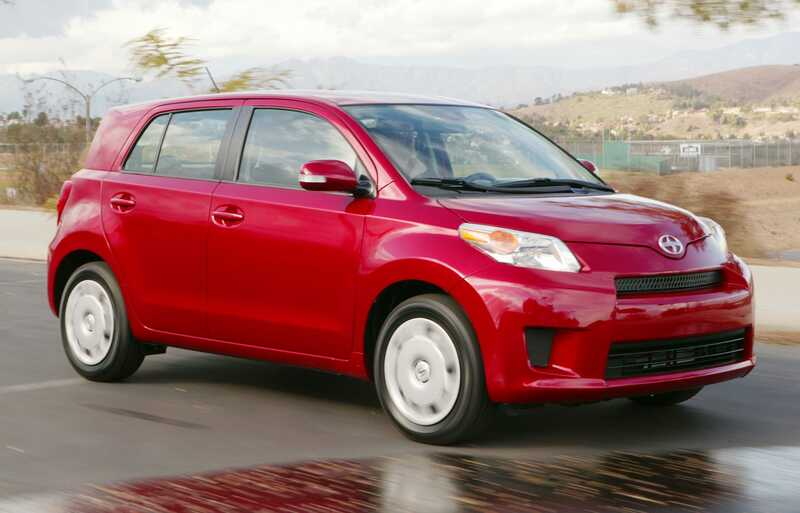 On some 2009 and 2010 model year Toyota Corolla, Corolla Matrix, and 2008 and 2009 Scion xD vehicles all equipped with 1.8-liter engines, Toyota says that if the vehicle is operated in cold weather, there is a possibility that condensed moisture from the positive crankcase ventilation (PCV) port may seep into the brake system vacuum port and freeze. Over time, ice may accumulate at the vacuum port and in the extreme case, ultimately plug the vacuum port, which supplies the power brake booster. Because of the accumulation of ice, power assist to the brakes would gradually decrease and lead to lengthened vehicle stopping distances. NUMMI is victim of the Great Recession and ongoing losses. A flop at sales of 6,000 units a month. Toyota Motor Corporation plans to transfer some Tacoma compact pickup truck production from the New United Motor Manufacturing Inc. (NUMMI) plant in California to Texas in a bid to improve the productivity of its relatively new truck plant in San Antonio. The Texas plant is widely considered a big money-loser because it was built to produce about 240,000 full-size pickup tucks per year, with expansion plans to double that, but will probably end up building about 70,000 trucks this year. 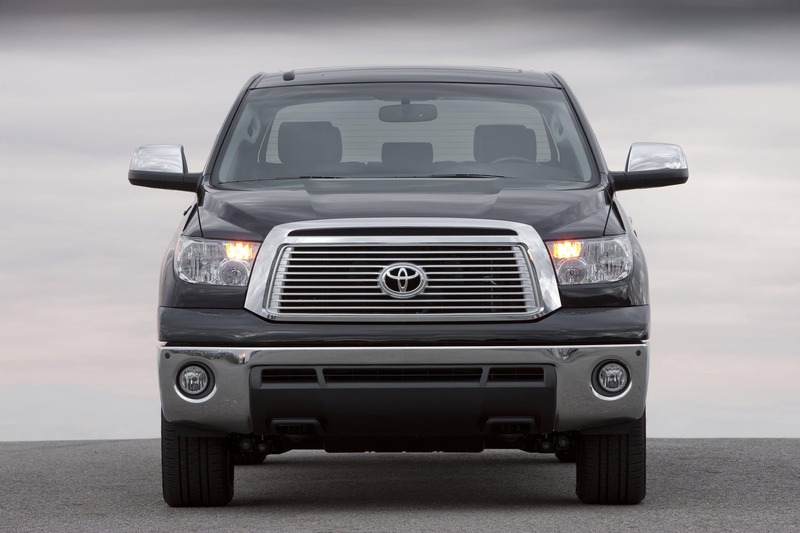 Total Tundra sales through June of this year were 36,000 units. However, given the modest volume involved — Tacoma in the first six months of this year sold 53,000 units — adding in the compact pickup truck to the model mix at San Antonio may not be enough to make the plant profitable. 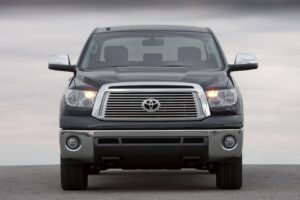 Sales of Tundra full-size pickup have never approached Toyota’s ambitious targets; and the continuing strength of GM and Ford in the full size truck market is making it very difficult for Toyota to gain market share. TMC Executive Vice President Atsushi Niimi said that Toyota also will now expand production of the Corolla in Cambridge, Ontario to offset the loss of production at NUMMI, which had been the principal source of compact Corolla models for the North American market. Corolla production will now cease at NUMMI in March 2010, Nimmi said. Niimi also said that Toyota will also have to increase imports of Corollas after NUMMI closes — so the company is protecting jobs in Japan where it has just closed an assembly line at one of its plants. In the medium to long-term, however, Toyota claims it would like to increase Corolla production in the U.S. Reading between the lines, however, Niimi’s remarks indicate that Toyota’s plans for further expansion in the U.S. have been shelved as it will to to save Japanese jobs as it contracts to stop multi-billion dollar losses. Niimi also implied that General Motors should get some of the blame for the closing of the Fremont plant. On the eve of national elections where the government is predicted to fall, more bad news for the export based economy. Local production ceremony of the CR-V sport utility vehicle in Wuhan, Hubei Province, China. Honda Motor Co., Ltd. said this morning in Tokyo that that its worldwide production outside of Japan showed a year-on-year decrease for the ninth consecutive month, going all the way back to November 2008. Worldwide production for the first six months of 2009 experienced a year-on-year decrease for the first time in 11 years. Exports from Japan in July 2009 also experienced a year-on-year decrease for the tenth consecutive month. Year-to-date production is off -32% in total as Japan’s second largest automaker continues to adjust to the ongoing Great Recession. Toyota, Japan’s largest automaker is also continuing to reduce output to adjust its excess inventories as a result of decreased worldwide demand. Toyota production was down for the twelfth straight month. It also announced that it will permanently close its giant NUMMI plant in California next March in its largest U.S. market, and has done what was once unthinkable, shutting down an assembly line at a Japanese factory. Toyota’s exports are off -57%, and its worldwide production declined -40% year-to-date. In Japan production was down -47%. All told, Toyota production at 3,613,369 vehicles is off -38% as it struggles to turn around the sales of its vehicles in the depressed market. Just weeks after formalizing the sale of Saab to Sweden's exotic automaker, Koenigsegg, GM will reveal the 2010 Saab 9-5 at the 2009 Frankfurt Motor Show, which opens next month. 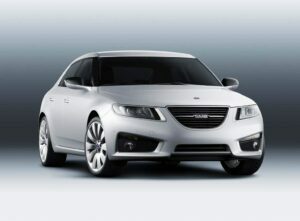 Mere weeks after its sale was announced as “final” but without the requisite government financing, the long-struggling Swedish automaker, Saab, will unveil what is arguably going to be the most critical new product in its history, an all-new version of the flagship 9-5 sedan. A prototype of the 2010 Saab 9-5, bearing the unmistakable imprint of the Aero X show car, will make its debut at the 2009 Frankfurt Motor Show, next month, with the actual sedan due to hit showrooms late in the ’10 model-year. Like the Aero X, the new 9-5 features wraparound glass and a gently tapered roofline. There’s also the Saab signature “hockey stick” beltline. The overall look falls somewhere between the hatchback styling the Swedish company was once known for and a more traditional “three-box” sedan. Is Chrysler Done With Dundee? Automaker may be abandoning yet another partnership. Will Chrysler boot partners Hyundai and Mitsubishi out of the Global Engine Manufacturing Alliance? With its new parent, Fiat, calling the shot, it’s looking like Chrysler may be ready to make some major changes in direction, notably by eliminating a variety of joint ventures with potential competitors. 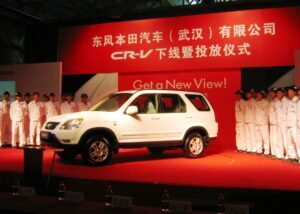 Earlier this week, TheDetroitBureau.com reported that Chrysler was calling off a multi-pronged project with Nissan. Among other things, Chrysler would have supplied the Japanese maker with a version of its Dodge Ram pickup to serve as a replacement for the slow-selling Nissan Titan. Now comes word Chrysler could be ready to pull out of the Global Engine Manufacturing Alliance. The four-year-old partnership with the Korean carmaker Hyundai and Japan’s Mitsubishi, got into production in October 2005, the $803 million factory, in Dundee, Michigan, producing a variety of small Hyundai-derived inline-four-cylinder engines for use in products such as the Jeep Compass.